For a short time there was hope that Ubuntu phones could make it to market before the end of the year, but it looks like that might have just been a pipe dream for Mark Shuttleworth. A new report is saying that Ubuntu phones more than likely won't be released until 2014 at the earliest; and, even worse, carriers may lock down the system. Mark Shuttleworth clarified the expectations, saying that the final version of Ubuntu phone will be part of the Ubuntu 13.10 (October 2013) update; but, now he says it's unlikely that any devices are officially released before 2014. The option we mentioned earlier where you could dock your phone to a tablet to get the tablet UI will become available after the update to Ubuntu 14.04 (April 2014). Shuttleworth also admitted that while Canonical will try to keep Ubuntu phone consistent, "It's open source, so it's possible for people to do grievous bodily harm to it." We've had fairly substantial conversations... none of [the carriers or OEMs] have expressed a desire to recreate the fragmentation of the Android operating system... I think my genuine impression is that people realize that fragmentation doesn't really help them. But, that impression doesn't seem to extend to keeping Ubuntu completely open, because carriers will still likely want to lock down the bootloaders on the devices. I think we should care. Ubuntu looks to be very functional and at the very least something we can look forward to. It will be some time before we can do more with it but as of right now I think its cool. Ubuntu is a real true Linux OS. Android is an OS with a Linux core. Let's not forget that Android does not have true multi-tasking either. no one cared about Android too few years back. This is exciting. Loving the tablet UI as well. 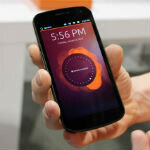 I'm excited to see what (if any) kind of impact a Ubuntu phone will make on the market. Same goes for the upcoming Ubuntu tablets as well. It's nice to have more options when considering a new phone and/or tablet. Bottom line, the more OS for people to choose from the better in my opinion. NO locked bootloaders. Geez just leave the devices alone. I'm so confused as to why Ubuntu is coming to phones. Android is Linux based...Ubuntu is a OS/UI off of Linux....So all they'll be doing is essentially using Android and making a launcher. yes i realize that that is oversimplifying it, but honestly thats pretty much what it is.